Overview: Having planned a trip to Kaas Plateau for the last 4 years, finally we decided to do it in 2018 while on our annual trip to Shirdi. From Shirdi, we took an overnight train to Satara, where we camped. Kaas Plateau falls under the Sahyadri ranges of the Western Ghats which is a UNESCO World heritage site. Prior booking is needed to visit the Kaas Plateau due to heavy crowd during the season. It is around 25kms from Satara. Our vehicle took us to Kaas early morning. At first, we could see a carpet of yellow flowers all around. It is said that different colours of flowers bloom at different time. Yellow was more prominent during our visit. We could see shades of blue and purple as well. A walk of about 2kms would take us to a pond which is filled with water lilies. One with great interest in nature can easily spend around 2 hours at Kaas. By this time we were hungry and quickly bought a plate of the local Pitla-Bhakri from a lady near the flowers. From Kaas we proceeded towards Mahabaleshwar, around 45kms away. The roads are pretty fine except a small stretch of around 300metres, which is in a really bad shape. Just before Mahabaleshwar, there is a very beautiful wax museum, run by Oshonic society for blind, founded by Bhavesh Bhatia. There are very talented people, who hail from differnt parts of India, from Ladakh to West Bengal to Andhra Pradesh. Its amazing to see blind people create such masterpieces which we couldn't resist but buy. From here we headed to Old Mahabaleshwar, which houses the Mahabaleshwar temple, and the Krishnai Shiva temple, where the river Krishna river originates. Its a very ancient temple, built in Hemadpanti style, now protected by ASI. This place is also the source of 4 more rivers- Koyna, Venna, Savitri and Gayatri. The Panchaganga temple marks the source of all the rivers. From Mahabaleshwar, we headed towards Panchgani, were we spent some time at Sydney Point, soaking in the beauty of nature. From there, we proceeded to Wai ghat, where there are temples dedicated to Ganesha and Lord Shiva alng the ghats of the river Krishna. Other attractions near Wai are the Lohare Palkeshwar Caves and Pandavgad Fort. The last place we visited was the Baramotechi Vihir, a massive stepwell built during the time of Virubai Bhosale in the mid 17th century. It has some interesting pillars and some carvings depicting Chatrapati Shivaji and some images of Lord Ganesha. 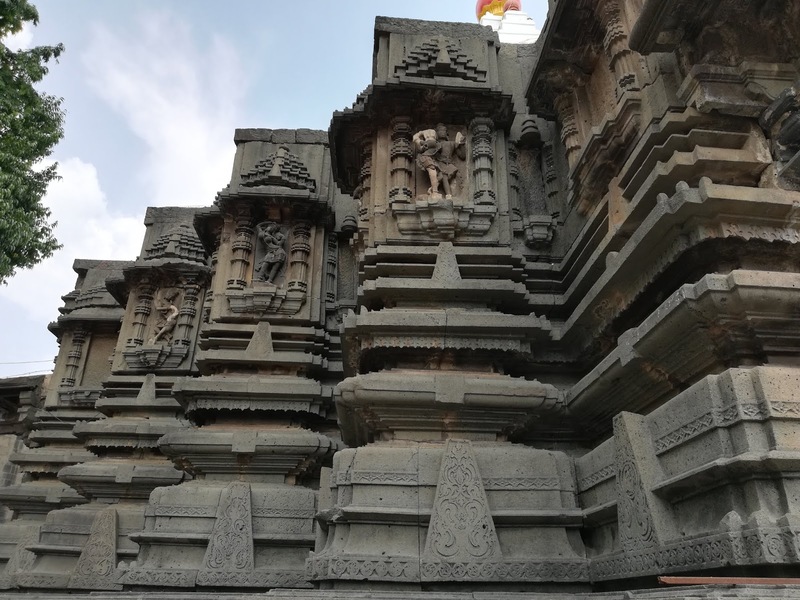 During our visit to Satara, we had one day to spare when we explored the town of Kolhapur. We visited the Mahalakshmi temple, locally known as Ambabai temple. The temple is built in the Western Chalukya architecture and dates back to the 7th century, and is one of the 108 Shakti Peethas. We had a good darshan and had the temple lunch just a few metres away from the temple. We spend a while admiring the architecture of the temple. From Mahalakshmi temple, we went to the Panchanga Ghat, where we saw a few partially submerged temples. On the banks, there are a few temples built in Hemadpanti style, but the temples were closed when we went there. We then went to the New Palace, which is the residence of Chatrapati Shahu Maharaj, a descendant of Chatrapati Shivaji. The palace was constructed in 1877, and has a huge clock tower, similar to Big Ben in England. The interiors have been converted into a museum, displaying artifacts from the time of Shahu Maharaj, including his weapons and his hunting achievements. On the Satara-Kolhapur road, in the town of Karad, we saw an ancient stepwell, probably dating to Chatrapati Shivaji's times. The stepwell is massive, and is protected by the Archaeolgical department. Hi sir, This is amazing photo. i need to learn about this after that planing to visit. The Western Ghats are internationally recognized as a region of immense global importance for the conservation of biological diversity, besides containing areas of high geological, cultural and aesthetic values. Loved the place during my last visit to India. Have been to Kolhapur Mahalaxmi Temple last year. It is a good example of ancient temple. Very nice sculpture.